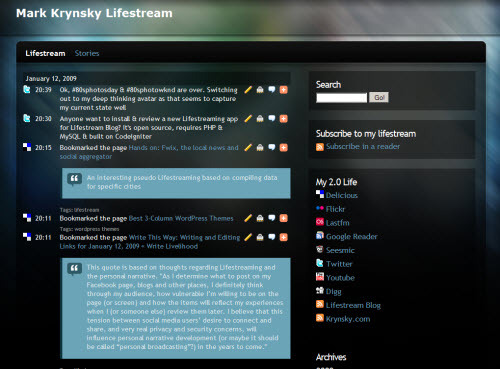 I wrote a review of new Lifesreaming service entrant Storytlr last October. I was impressed with this service at the time and with today’s announcement of added features continue to thing that this is a great alternative to creating your own self hosted Lifestream. You can get the abilities of running a WordPress blog with a Lifestreaming plugin up and running very easily and quickly. You can even have it point to a custom domain. Support for new sources. We’ve added Facebook, Laconi.ca / Identi.ca, StumbleUpon, Twitpic, Tumblr and Vimeo. We now import all data we can get. Twitter, Digg, Delicious and Seesmic update in realtime thanks to GNIP. Automatic crossposting of any source to Twitter. Let the world know about you and automatically post storytlr items or any other source to Twitter. Bookmarklet to post Storytlr items. With the new bookmarklet you can easily post your discoveries on Storytlr. 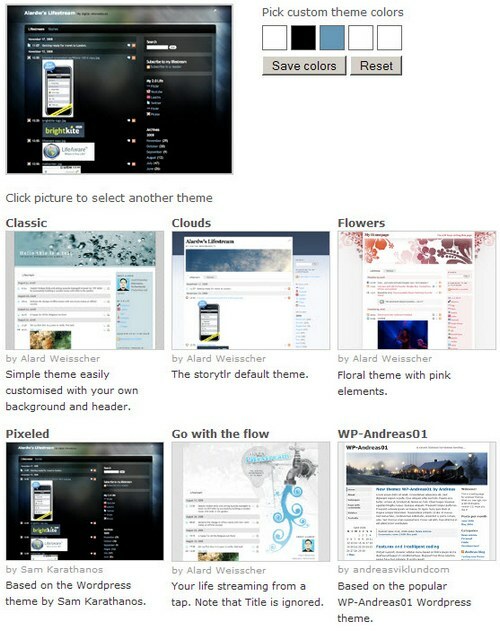 Embed widgets and stories in your blog. You can now include Storytlr widgets displaying your latest feed items or stories on your blog. You can also embed stories. New templates and design your own. We’ve added a few more templates to choose from, upgraded the default template and allow you to use your own css. We also refreshed the storytlr source icon. Edit any item from any source. You are in control and can change the date and often content of all items on the stream. You can now put a note on items to explain more about why you incuded it. If you haven’t taken a look at this service I encourage you to do so it’s really one of the more interesting additions to come out last year and they continue to enhance it with no signs of slowing down anytime soon based on the business plan discussed in the review at Ars. Hey, your post is a little confusing. You can get the abilities of running a WordPress blog with a Lifestreaming plugin up and running very easily and quickly. I understand that you can have a wordpress blog and a lifestream plugin, but that has nothing to do with Storytlr, or do they have a plugin of which I'm not aware? Anyway, Storytlr is doing a great job. I would use this service as my exclusive lifestream, but I'm waiting for a couple more features that I can do with a wordpress plugin. Thanks Mark for the update ! Great to see that you like our new features. Indeed, we have no intention to slow down, we have lots of stuff on our roadmap and plenty of feedback to act upon, so expect to see some more evolutions in the coming weeks ! @traeblain I'm not sure what Mark refers to but you could indeed have http://lifesetram.traeblain.com powered by storytlr and using your blog template. This would give the illusion of integration. You can also embed the page in an iframe on your blog and use css to hide things you don't like. What I was trying to state is that Storytlr offers very similiar functionality to what you would get if you were to install WordPress + a Lifestreaming Plugin, only far easier. You also have the ability to have a custom domain (as eschnou points out below) as well as the functionality offered by using custom widgets in WordPress. Hopefully that clears up the confusion.